Continuing our fascination with Dictator’s yachts comes news of an interesting trip by reclusive North Korean leader Kim Jong-un. It seems that last month the despotic dictator chose to cruise the coastline of his impoverished country for ten days in a Princess 95 – a boat that could be prohibited under U.N. sanctions imposed due to its nuclear and missile tests. North Korea’s KCNA news agency released a photograph of Kim on May 28 that showed him walking along a dock with military officers. 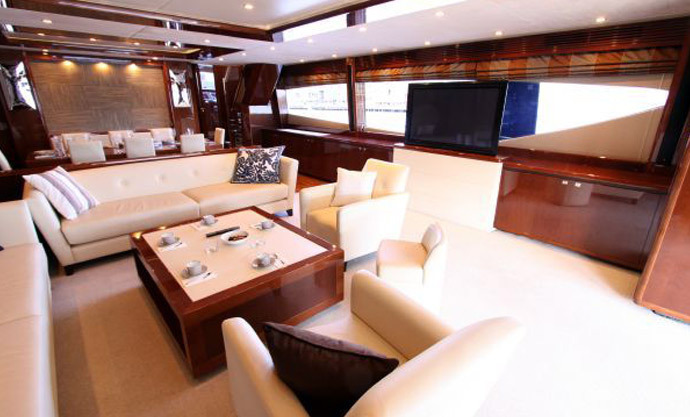 The starboard side of a luxury boat is visible to the right of the picture. His predecessor, Kim Jong-il had failed on two occasions to procure luxury yachts but they were seized in Italy and Australia in 2009 before being delivered. The two yachts look almost identical, making the purchase and shipping of Kim’s Princess difficult to track – unlike the 95MY, the newer and larger 98MY is not yet available to buy in Asia, and numbers are few. 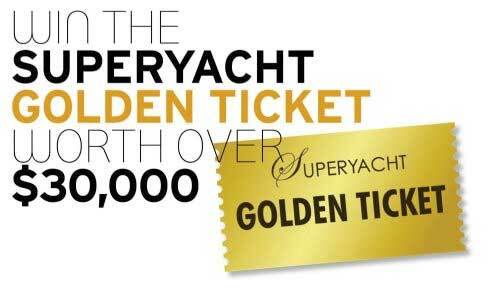 “As we suspect, if it is a 95MY rather than a 98MY then the number of vessels is much greater and, given we launched the 95MY some years ago, many of them will have since changed hands on the private brokerage market,” Will Green, Sales Director for Princess Yachts International, told NK News. Princess, keen to avoid damage to their brand image, are now conducting their own investigation to trace the sale process. 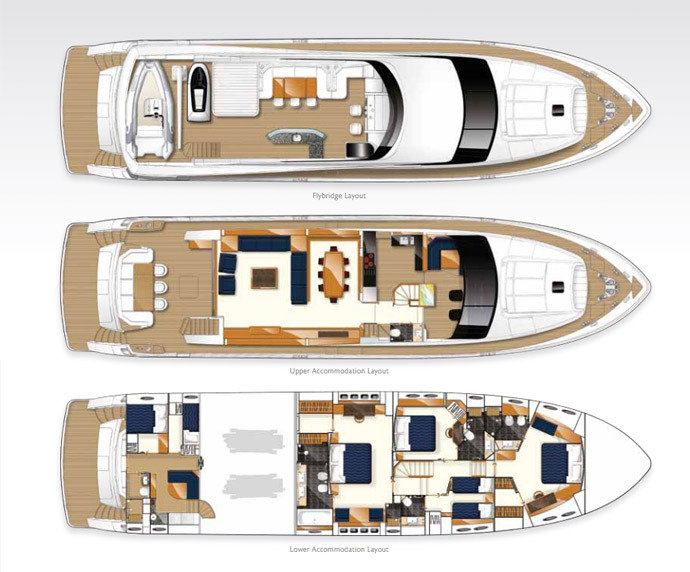 “The expansive flybridge deck, generous staterooms and full width saloon and dining area can accommodate up to ten people in elegant style; taking the pleasures of extended life on-board to an entirely new level,” a Princess 95MY brochure reads. An updated version of the 95MY, the Princess 98MY, sells for more than $8.7 million, NK News said. 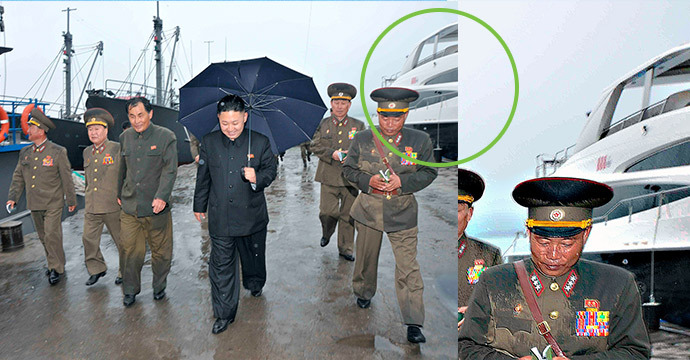 During an inspection of the ‘August 25th Fishery Station’, the starboard side of a large luxury yacht was captured in a May 28 KCNA photo of Kim and his generals walking along the docks – indicating it might have been deliberately included in the photo. “Compare the details on the hard top roof between this and the Princess 95MY. The opening, the three stainless-steel bar supports under the flying deck roof and the detailing on the radar arch are all identical,” added a source, who did not want to be identified. Theories as to how the boat made it to the remote country centre on links to Chinese companies. Large cargo ships called “Yachtships” are normally used to transport luxury yachts, although they often leave their cargo exposed, and clearly visible to prying eyes. It’s believed that the ship transporting the Princess also imported equipment to produce artificial snow and ski-lifts for the Masik Pass Ski Resort near Wonsan. In collusion with the crew or supplier, it would be perfectly possible to place a superyacht in the middle of a wide container ship, then surround it with containers on all sides. Then a tarpaulin over the top would conceal it from aerial view.